Your brushes are an important investment. By cleaning them thoroughly and properly at the end of a painting session, they will work better and last longer. It is well worth spending the little bit of time necessary to take good care of them. There are general guidelines to cleaning brushes but also some particulars regarding the specific medium you are using. Wipe off any excess paint using a cloth or soft tissue. Gently squeezing the bristles from the ferrule edge outwards with your fingers, or with a cloth, will help remove paint from the brush. Be careful to avoid pulling on the bristles, though. Rinse the brush in turpentine or oil if you've been using oils, or lukewarm water if you've been using a water-based medium. Never use hot water as it can expand the ferrule, causing the hairs to fall out. Wipe the brush on the cloth again to remove the last of the excess paint. Wash gently using a little bit of mild soap (or a gentle dishwashing liquid). Dab the brush gently onto the piece of soap, then work up a lather in a small container or the palm of your hand if you're not using any toxic pigments or solvents. Rinse and repeat until there's no trace of any color coming out. Over time a brush may become stained, but don't stop rinsing until you're sure there's no paint left. Rinse once more in clean, lukewarm water to remove any traces of soap. Shake off the water. Use your fingers to gently shape the brush head into its correct shape. If necessary, wrap the bristles in a piece of tissue or toilet paper while the brush is still wet. When the paper dries it will contract, pulling the bristles into shape. Leave brush to dry at room temperature. Ensure that it is not resting on its head so it does not dry misshapen and ruin the brush. Let the brush dry flat or standing on the back of the handle. Make sure not to crowd the brushes together. If you're worried about the toxicity of the paint you're using, or it is staining your skin, wear gloves while painting and cleaning your brushes. You might also try the Bob Ross Painter's Glove lotion for oil paints. (Buy from Amazon). 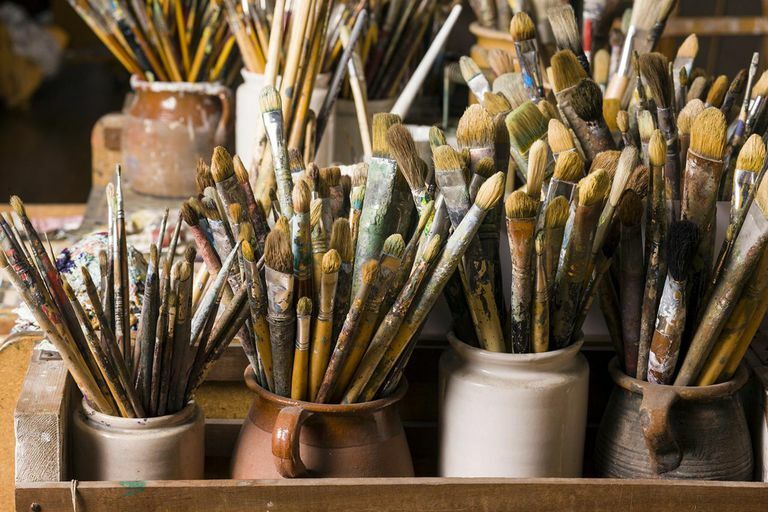 Always use separate brushes for oil painting and water-based medium; after all, oil repels water. It is not recommended to use a brush for acrylic that you have already used for oil. Also use separate brushes for varnish, gesso, and masking fluid. Masking fluid is particularly hard on brushes so use cheap synthetic brushes when applying it. Acrylic paint takes extra attention because it dries so quickly. You don't want to leave your brushes out of the water for long with paint on them because the paint will dry on the bristles, and once acrylic paint is dry it is water resistant. However, you also don't want to leave a brush standing too long in water for it will ruin the brush. It is best to use a shallow tray to keep the bristles wet when you're not using the brush while painting, letting the handles rest on the rim of the tray; this will help keep the lacquer paint on the handle from getting wet and eventually flaking off. Acrylic brushes should always be dampened before loading them with acrylic paint. This will help keep the paint from sticking to dry bristles and creating a clump of hardened paint. There are synthetic bristle brushes available for acrylic painting that are made to withstand the demands of acrylic paints. These also clean up more easily than natural hair brushes. The synthetic Princeton Catalyst Polytip Brushes (Buy from Amazon) are good for both medium-bodied and heavy acrylic and oil paints. If working in oil and your brush is made from natural bristle, you can soften it by dipping it in clean oil (the one you use as a medium) after you have cleaned it. Never leave any brush standing for too long with the bristles touching the bottom of the container, particularly soft-haired brushes. Make sure to clean out all the paint near the ferrule of the brush. The bristles will splay out if the paint hardens here. After the final rinse and shake dry, smooth out the brush and shape the hairs with your fingers and thumb. Make sure brushes are dry when storing them in a covered box. They can develop mildew if stored in an air-tight container. Mothballs can help protect natural hair bristles from moths when storing. Brush washers, such as the Guerilla Painter Brush Washer (Buy from Amazon), allow you to keep your brush in medium or water, resting on a grate that is suspended above the "sludge" that accumulates on the bottom of the metal container. General Pencil Company's Master Brush Cleaner and Preserver (Buy from Amazon) cleans and restores brushes even after acrylic paint has dried and hardened in them. It cleans brushes used with oils, acrylics, watercolors, and gouache.